Supergirl -- "American Alien" -- Image Number: SPG401b_0101b.jpg -- Pictured: Melissa Benoist as Kara/Supergirl -- Photo: Bettina Strauss/The CW -- ÃÂ© 2018 The CW Network, LLC. All Rights Reserved. I took on the tough task for you, dear reader. I watched the season premier of the CW’s Supergirl so you wouldn’t have to, and now you can see what you missed. Or didn’t. Warning: This post contains spoilers for the premier, if you actually want to watch it, don’t read ahead just yet. 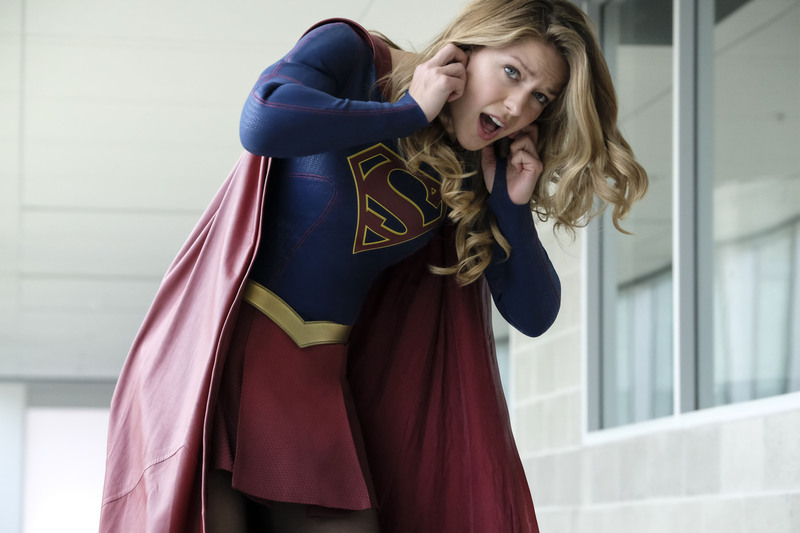 We rejoin our caped heroine some time after the finale and the end of Reign: Supergirl is saving the world, not just National City, as Superman is off-world. She is somehow managing to fight crime, save derailed trains–as well a little girl’s balloon because she is still a local hero, after all–and be a world-class reporter with a newly assigned protegee, who is basically Season One Kara (ie. : full of hope, but also lacking the confidence to just go after the article assignments she’s passionate about). Kara’s also trying to solve National City’s latest problem. This leads us into our first subplot. J’onn J’onzz is in an alien support group. He has really taken his father’s parting words to heart and is walking the peaceful route by helping other aliens adjust to hiding in plain sight among the humans. When one of his group members is attacked, J’onn tries to explain to Kara that this is yet another alien-related hate crime, only to be ignored by Kara. There is, as expected, some discourse between the two before Kara discovers, and humbly admits, that J’onn was right about all of it. She is able to further admit that she doesn’t know how to handle this type of problem because, again, he was right that she passes for human so she doesn’t experience the same issues as other aliens. However, J’onn is unwilling to help Kara with this anti-alien terrorism because he’s on the peaceful path and doesn’t believe rejoining the fight is part of that path. My problem with this anti-alien plot is three-fold. First: it’s being headed by a brother-sister team that is actually headed by a mysterious man in an iron mask. This is something that is so overdone in other things that it didn’t feel even remotely fresh. There was no new perspective or take on that villain dynamic, not even anything to hint that there would be in future episodes, and that had this viewer waiting for the episode to move on to a different villain for the season to focus on. Second: this whole thing is hitting a bit too close to home with actual current events. I don’t know about you all, but I don’t come to shows like these to see thinly veiled parallels to my real life. Third: J’onn taking the peaceful route seems like a weird way to either cut out the character or give him a momentary break from the fight before he has some weird Martian Mind-trip with his dad’s ghost and realizes that he’s not promoting peace by being this passive. Passivity can be almost as harmful as joining the villains in cases like these. Who is this masked leader of the Anti-Alien Regime? Side plot number two shows us Lena Luthor trying to run her company, while getting the DA to back off of the charges against James Olsen for being Guardian. This, and the plot with Kara’s new men-tee, honestly took so much from the main plot of the racism (species-ism?) that I have to mention it here just to point out that it was unnecessary. This was mainly because I had forgotten that James even got arrested for being Guardian last season, but it was also because Lena couldn’t just let James handle it like he told her he wanted to. I understand wanting to help, but there was no need to betray him and her mother in order to get the DA to drop the charges. The highlight of this is that now we get to wait for James to find out she did this and get mad at her. Though, with the way the writing has been so far, his anger will only last an episode. Meanwhile, Alex Danvers is adjusting to leading the DEO. She’s training the new agents, meeting with the President, and trying to accept that Winn is gone and she has to work with Brainy. Don’t get me wrong, Brainy helped so much last season and a lot wouldn’t get done without him, but he is not Winn. Unfortunately, the show whittles the Brainy/Alex communication problem down to just that: Brainy isn’t Winn and Alex isn’t as adaptable as she thought. This seems very reductive. I mean, communication problems can’t just be swept away with a “Oh sorry, I wanted you to be someone else. Now that we’ve got that in the open, we can totally understand each other perfectly.” This left me dissatisfied, and on top of everything else this episode tried to throw at me, I was already there. You may be saying at this point: Justine, what about the Supergirl version of Red Son from the end of last season? I’m glad you asked, dear reader. We do get to see Kaznian-Supergirl in this episode. Technically. It’s in the last 30 seconds of the episode and all we see is her punching cave walls to get stronger, which raises at least three questions. One, why isn’t she already as strong as Supergirl? Two, is she actually Kryptonian, or is she some sort of Kaznian government experiment? And three, when we see Supergirl saving a train in Kaznia at the beginning of the episode why is it our Supergirl and not the Kaznian one? Why can’t their Supergirl save them? I am looking forward to getting some answers from this season, but mostly I’m just hoping for fewer subplots next week. Yes, I will keep watching this season for you all. Maybe, they’ll win me back over. Sam is just fine now? Girl went through a traumatic experience where she almost died and now she’s just running a branch of L Corp and coaching her daughter’s soccer team? I call shenanigans. All of this trouble is because Kara said she was finally in control of her life. That abandoned warehouse fashion district sounds like a recipe for disaster. Previously uninhabitable warehouses and it’s in a high crime area? Supergirl is going to be down there all the time. What happened to Alex wanting to be a single mom? Is she just giving up on that and going back to finding a wife to help raise a kid while she runs the DEO? So many questions about this sub-subplot. Oh no! Everyone knows that President Diana Prince is an alien. I had honestly forgotten about this tiny reveal from season 2. I am curious about the return of Kryptonite in next week’s episode though. Looking forward to Kara being mad that it still exists, again.